Use morning and night by applying with cotton ball on closed lids. Sweep cotton ball or pad over closed eyelid and lashes until all traces of makeup are removed. Another good product from L'Oreal. Nice and cheap and works really well. Really refreshing on the lids and gets rid of all stubborn make up! Nothing bad to say about it really. Great benefits at a small price! 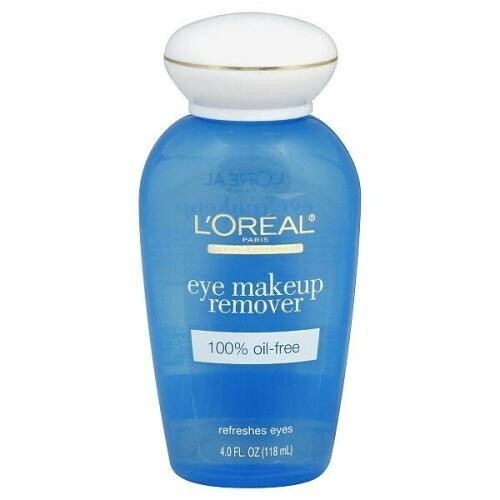 The L’Oreal Gentle Eye Makeup Remover can easily compete with expensive products; it is everything a good makeup remover should be: gentle, easy to use, quick, with no irritation and very soothing. Everything about this product is really great starting from its scent which is a barely there clean, fresh smell and ending with clean, simple packaging which consists of a blue bottle and a white screw on cap, everything in between being the great quality of this product. This makeup remover is oil free and is made with pro-vitamin B5 which helps hydrate the skin which means that the very delicate skin around the eye will not be subject to drying-out and premature wrinkles or deeper wrinkles. 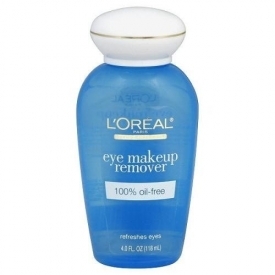 For an even stronger formula to combat hard to remove eye makeup and lipstick try the L’Oreal Gentle Waterproof Eye and Lip Makeup Remover. These sister-products are oil based which makes the formula that much stronger without leaving any nasty greasy residue on your skin. They are as soothing and soft as their oil-free counterpart.